The first movement is quite simply a long-drawn-out melody which the flute 'sings' and then elaborates expressively. A rapid, syncopated movement with a 'floating' middle section. A slow theme and a variation, culminating in a short cadenza, which leads to the fourth movement. A mischievous 'whistling' march. However, the bustle and gaiety of this lively movement is interrupted by a second cadenza from which re-emerges a shimmering version of the theme from the first movement that now accelerates with a crescendo into a short and energetic Coda. Composer's note: I played the flute at school and always held a special affinity for the instrument, often composing prominent solos for it within the context of my orchestral music, but never completing a concerto. The flautist Gay Byam-Grounds had been the soloist and leader of the English Serenata who had formed the ensemble which helped me develop the full-length stage show of 'The Snowman' from 1993 onwards. In 1996 as an enthusiastic performer of my music she summoned up the courage to commission a concerto and I accepted. As often with my music the main theme had been in my mind for some years and I now committed it to paper. 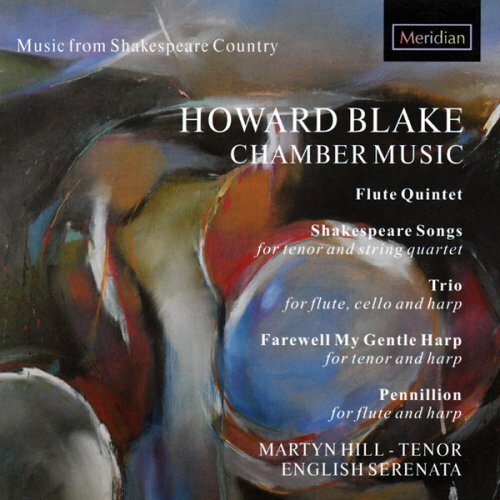 There were no professional musicians in the Blake family of Brighton, but teachers quickly recognized Howard’s talent and eventually steered him into the Royal College of Music. He became active as a pianist, composer, and conductor in the commercial music world in London, composing a great deal for television (notably for the 1960s cult spy drama “The Avengers”) and film. Blake’s best-known score is “The Snowman,” originally for a short 1982 animated movie, later reworked into a concert piece and several stage versions. As his career developed further he began to concentrate on classical concert music. His catalog of works runs to nearly 700 opus numbers and he continues to add to it as well as to perform. 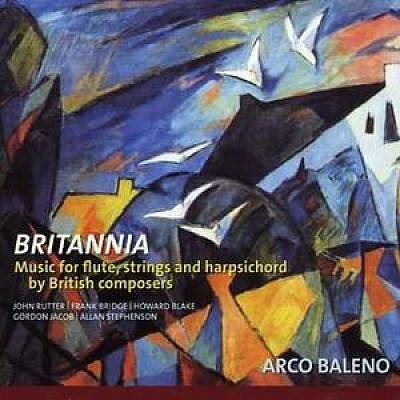 Blake’s melodic material is usually simple and attractive, though it may be worked out with considerable artistry. His style seems familiar without evoking any particular idiom from the past. An example of his slightly out-of-the-box approach comes at the beginning of this quintet, where the flute plays against a background of strings playing tremolando—a shimmering effect more typical of orchestral music than chamber music, but extremely effective here. This is a delightful disc, high in opus numbers but also high in quality too. The Flute Quintet dates from 1996 and is cast in four movements. Warm lyricism and avian calls are the index for this, with the flute singing its verdant morning song in the opening Allegro Cantando. After a vibrant Scherzo there’s a lyrically textured slow movement and a light-hearted march finale with some strummed accompanying figures to vary textures. A rather earlier work is the Shakespeare Songs for tenor and string quartet. Blake takes well known songs from As You Like It and Twelfth Night, as well as single songs from Cymbeline, The Tempest and Love’s Labours Lost. The result is a cycle that confounds expectations. None sounds very much like anyone else’s settings. The bucolic old-time settings of, for example, When Icicles hang by the wall is not replicated in Blake’s own setting, nor are there Finzi-esque moments either. Blake paints his words with discreet delicacy, not playing up the ‘freeze’ in Blow, blow thou winter wind, though he certainly does push the tenor very high in Full fathom five, the more to accentuate its eerie sense of loss. He does so again in Come, away death with the same result - Blake sees things differently from the more baritonal consolations that other have wrought here. If there is an influence, I would sense Britten, especially in When Icicles. The Trio for flute, cello and harp is an arrangement of a 1962 work for flute, clarinet and piano. It survives the transition delightfully. French in orientation, cleanly and clearly lyric, generous in its melodic grace, it is a work of perfectly poised charm. Farewell My Gentle Harp is another vehicle for Martyn Hill, a Gaelic lament and truly lovely. Meanwhile Penillion for flute and harp – other versions exist – is inspired by Welsh music, though gently. I’ve heard it in its incarnation for violin and piano, and it’s perhaps not too surprising that this flute and harp version sounds far less ‘Carpathian’ in one or two of the variations, and rather more sweetly emollient. It ends a beautifully performed and enticing disc. Full praise, then, to Hill, always a most articulate singer, and to the players of the English Serenata for their mellifluous and sensitive playing, to the fine recording and to the booklet with its full texts. A transcription from the original Flute Quintet. An arrangement of the flute quintet, opus 493.